Bus from Teluk Intan to KL is the most frequent and most popular bus service in Teluk Intan Bus Terminal. Besides serving Teluk Intan residents, residents from towns like Sabak Bernam and Simpang Empat also come to Teluk Intan Bus Terminal to take the bus to Kuala Lumpur. 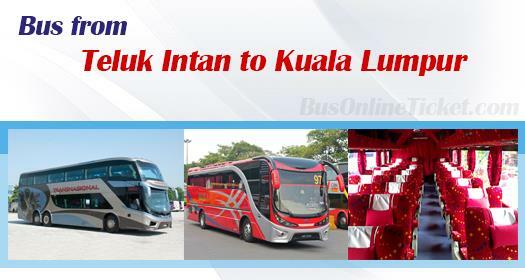 Transnasional is the dominant player for this bus service route between KL and Teluk Intan. They virtually provide hourly departure from Teluk Intan to KL, starting from morning 8AM until night 10.30PM. Maju Express is the other player supplying bus from Teluk Intan to KL. They offer just 1 daily departure, but operating with the spacious 3-seat-a-row VIP coach to ensure a comfortable journey for passengers. Hence passengers have the choices to choose between frequent bus service by Transnasional and luxury travel experience by Maju Express. It takes about takes about 3 hours non-stop service from Teluk Intan to KL. Washroom break can be arranged upon request. The bus fare for bus from Teluk Intan to KL is reasonably charged at RM 15.60 by Transnasional and charged at RM18.30 by Maju Express. After the closure of Old Teluk Intan Bus Station, coaches have changed their departures to Teluk Intan Bus Terminal located at Teluk Intan new town area. The arrival point in Kuala Lumpur is at the newly built modern bus terminal TBS (Terminal Bersepadu Selatan). Kindly note that the old arrival point Pudu Sentral has been closed since 1st Nov 2015. Passengers are advised to book their Teluk Intan to KL ticket online with BusOnlineTicket.com in advance to avoid disappointment. Bus is filling fast especially on Sunday when everyone is going back to KL to prepare for work the next day. Besides that, the queue at the Teluk Intan Bus Terminal is always long. Online booking could save your hassle from queuing for the bus ticket.